After a tumultuous 24 hours and a failed attempted at halting the process, Brazil’s Senate will vote Wednesday on whether to impeach socialist President Dilma Rousseff. Should the Senate vote in favor of impeachment, Rousseff would be immediately replaced by her vice president, Michel Temer, for 180 days or until the Senate trial against her concludes, either confirming her ouster or reinstating her. Senate President Renan Calheiros confirmed on Tuesday that he hopes to begin the impeachment voting process at 9 a.m. Brasilia time on Wednesday. 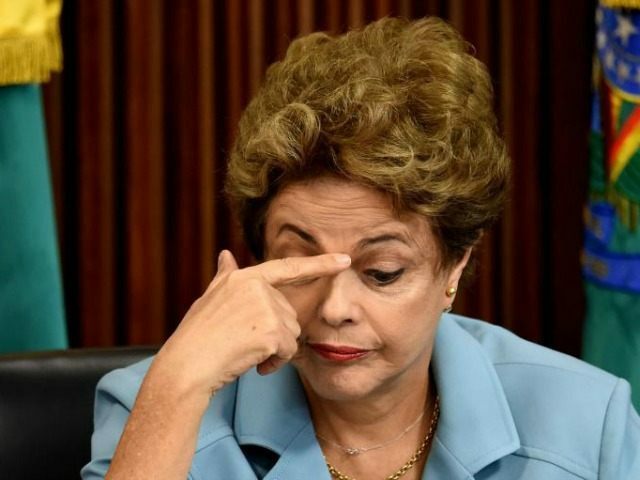 “The goal is to finish the session by the end of Wednesday.” The Brazilian newspaper Folha de S. Paulo reports that surveys within the Senate show that 51 senators would vote in favor of impeachment, well over the simple majority needed to strip Rousseff of power. Whether the Senate would get to vote on impeachment remained in question on Monday, as the new acting head of the lower house of Congress made a motion to annul the House of Representatives’ vote in favor of impeachment. Waldir Maranhao of the center-right Popular Party (PP) replaced Eduardo Cunha, who was removed from his position due to an ongoing corruption investigation against him. Cunha, of the leftist Brazilian Democratic Movement Party (PMDB), stands accused of taking more than $5 million in bribes from corporations looking to do work with the state-run oil corporation Petrobras. On Monday, Maranhao attempted to annul the vote conducted under Cunha to impeach Rousseff, alleging a number of irregularities in the way the vote took place, including accusing members of Congress of voting for impeachment for reasons outside of the accusations at hand: that Rousseff used unlawful executive power to misrepresent the state of the Brazilian economy to foreign investors. The PP, which supports impeachment, threatened to expel Maranhao for the move, while Senate leaders disregarded it. The head of the Senate Impeachment Committee, Raimundo Lira, noted that the House vote had already occurred and could not be revolved for “political” reasons. Calheiros and others supporting the Senate vote argue that Rousseff had four months to persuade legislators to vote against her impeachment. In the House, she failed, Calheiros argued privately, according to the Folha de S. Paulo. Michel Temer, the would-be president, is staying in the background of the ongoing drama. He is scheduled to deliver a public statement on Thursday, however, following the impeachment vote. If the Senate votes to impeach Rousseff, Temer is scheduled to announce his new presidential cabinet on Sunday. On Tuesday, a small group of pro-Rousseff protesters in Sao Paulo and other metropolitan hubs began organizing violent protests, burning tires and blocking traffic. The images of streets burning are a stark contrast to the mostly peaceful – despite attracting over three million people – protests calling for the socialist leader’s ouster.